I apologize for my month-plus long hiatus as I just now settle in Corvallis and hope to commense daily blogging in earnest. 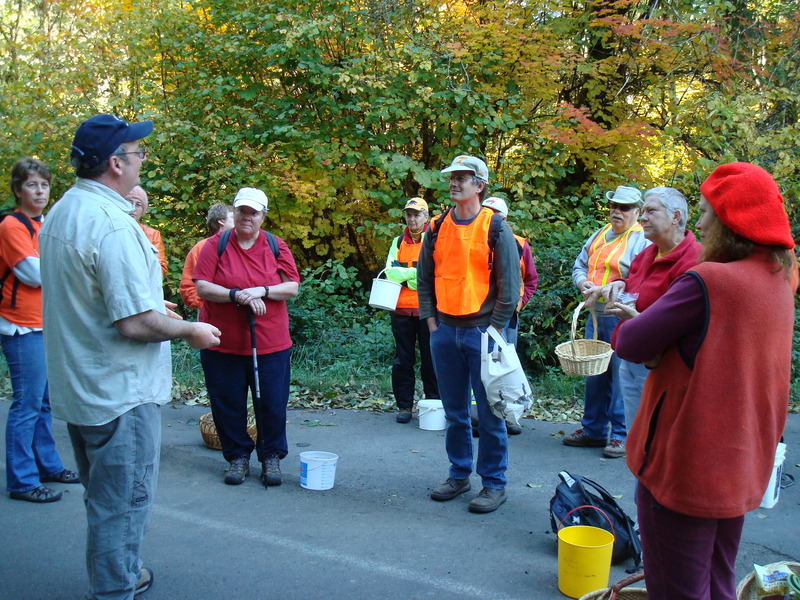 We’re embracing all life has to offer here, which on Sunday included a wild mushroom foraging expedition with the new Slow Food Corvallis group here. It helped that it was a perfect nearly 70-degree day that made it hard to accept the rains are coming. Our fearlesss guide was Rex Swartzendruber, a professional forager who sells his finds at Corvallis and Salem markets and online at TruffleZone. He spoke with eloquence about the important symbiotic (or parasitic) role mushrooms play in maintaining the Coastal Range forests’ delicate eco-systems, how everything, from the trees to the fungi to the arthropods that crawl and digest the soil beneath them, is connected. When the timber companies clear-cut the forests, the trees aren’t the only natural resource to go. 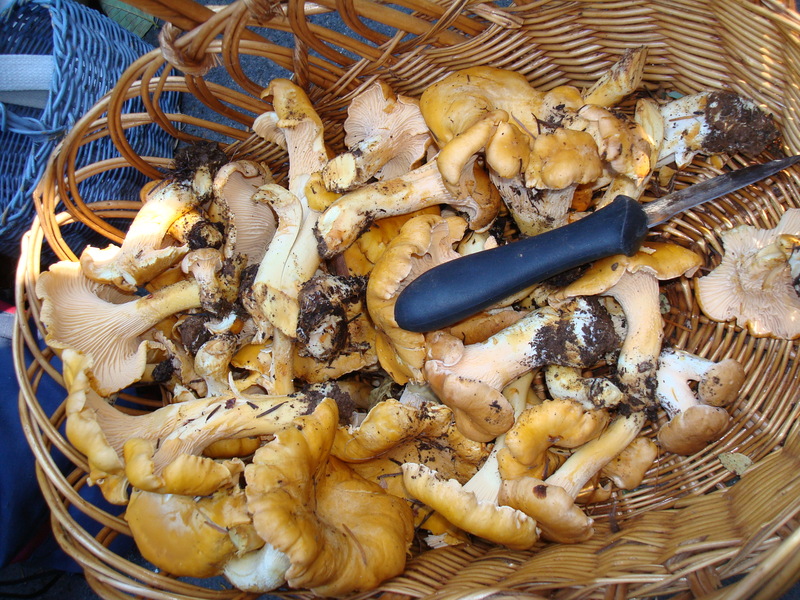 Chanterelles take 15 years to reappear after a forest has been clear-cut, Swartzendruber said. What’s more, Big Timber, he said, has been blocking access to public forests where foragers are normally free to hunt. “Access for a mushroom picker is everything,” Swartzendruber said of his livelihood. 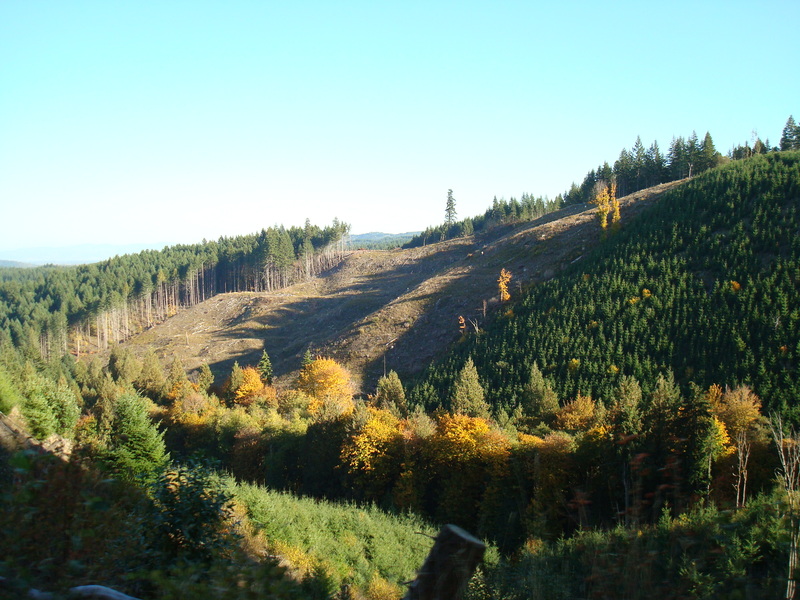 The deforestation was apparent on our ride back to Corvallis. 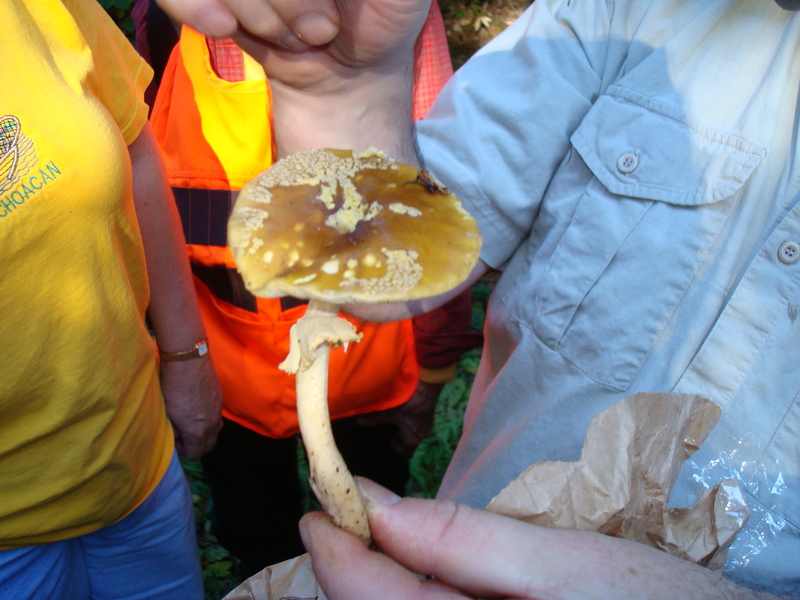 The risk of accidentally plucking a poisonous one almost makes wild mushrooms a heightened delicacy. I kept thinking of fugu, which is popularly eaten in Japan but can be lethal if prepared incorrectly. We avoided false chanterelles with more orange gills and a darker cap. The potently toxic amanitas were the scariest mushrooms we found but could be easily identified with their white-dotted “veil” caps and lacy skirt on the stem, making the lethal mushrooms sound feminine, almost bridal (see below and AVOID). But the highlight of the day was the $20 three-course mushroom dinner Swartzendruber arranged for us at Sybaris Restaurant in Albany, the city that neighbors Corvallis. Chef Matt Bennett, who graciously hosted us on his day off, was still beaming from recent press he got in The Oregonian about a meal he recently prepared at the James Beard House in New York. For dessert, we got a litle taste of Bennett’s celebrated Oregon black truffle ice cream (made with powder from TruffleZone) but what was really remarkable was the candy cap mushroom panna cotta which had a rich maple flavor that exclusively came from the fungus. The appetizer was leek and potato soup with sauteed lobster and shrimp mushrooms, the later which we found while foraging. When it smells like rotten seafood, it’s too late to pick them. The Russian-inspired main course was lamb two ways: loin with wild mushroom Stroganoff and a particularly memorable “Communist cutlet” lamb patty with chantrelles (the French spelling) on creamy Savoy cabbage. Bennett, who just also opened a more casual Italian cafe near Sybaris, seems committed to a downtown Albany rennaissance. The historic buildings apparently used to house brothels for the timber workers. Thanks but boy those mushrooms cooked down to nothing when I sauteed them last night!